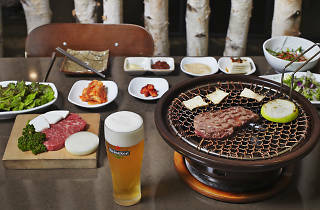 When you walk along the street behind Itaewon Hamilton Hotel, you’ll see a row of windows that are wide open and through which there’ll be groups of foreigners grilling meat. It might be the unlikely geographical location of Maple Tree House in Itaewon, or the modern interior that doesn’t look like your typical Korean BBQ place. Whatever the reason may be, one thing that’s for sure is that it has captivated the hearts of Koreans and foreigners alike. There’s always a 50:50 ratio among customers. It’s also a popular spot for workers to go for their company get-togethers. The signature Maple Tree House dish is the aged hanwoo (Korean premium beef) sirloin. The thinly sliced beef loin that comes with a savory sauce is also a favorite house dish. 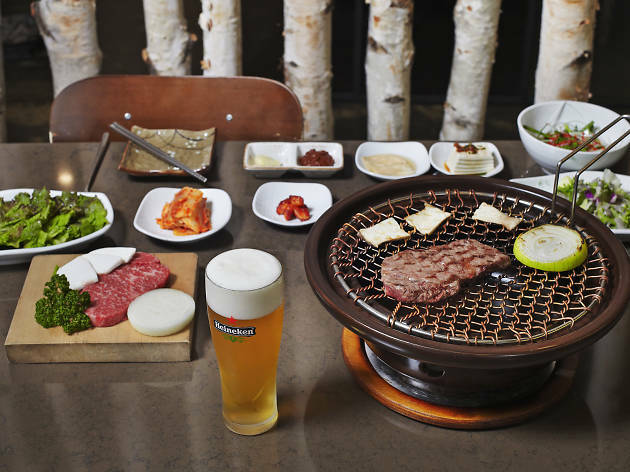 When they open up all their windows in the evening, a cool breeze blows through, making it the perfect setting to enjoy your Korean BBQ and Heineken beer. Aged hanwoo sirloin (150g per serving) 34,900 won, Jeju heuk dwaeji ogyeopsal (black pork belly) (150g per serving) 16,900 won.